Founding a startup in the modern world is becoming increasingly difficult. Between fierce competition for venture capital, market share and new challenges presented by an ever-changing business environment, entrepreneurs are regularly stepping headfirst into unclear waters when they decide to create their startup and naturally quite a lot of them fail. In this post, we will be exploring some of the reasons why. Despite these challenges, we have statistics to show that the startup market is still going strong. For example, according to Fortune, the number of people who are self-employed in the United States has increased by around 150,000 to 8,602,000 in 2017. This shows that even with the unforgiving environment, an increasing number of people are founding their own startups. Furthermore, the worldwide outlook for startups is equally hopeful, with a GEM Global Report showing that over 100 Million startups are being launched worldwide, every year. This is a staggering 3 new businesses being founded every second. This shows that even with the intense climate for newly founded businesses, there is no shortage of people willing to take the plunge and try their hand at running a startup. One popularly cited and particularly damning statistic about the startup climate suggests that over 90% of startups actually fail, with only 10% actually experiencing long-term success. This statistic comes from a report by Startup Genome. The reason for this? According to Startup Genome, over 70% of startups experience premature scaling, which could provide some insight as to a big reason why a lot of startups are failing. 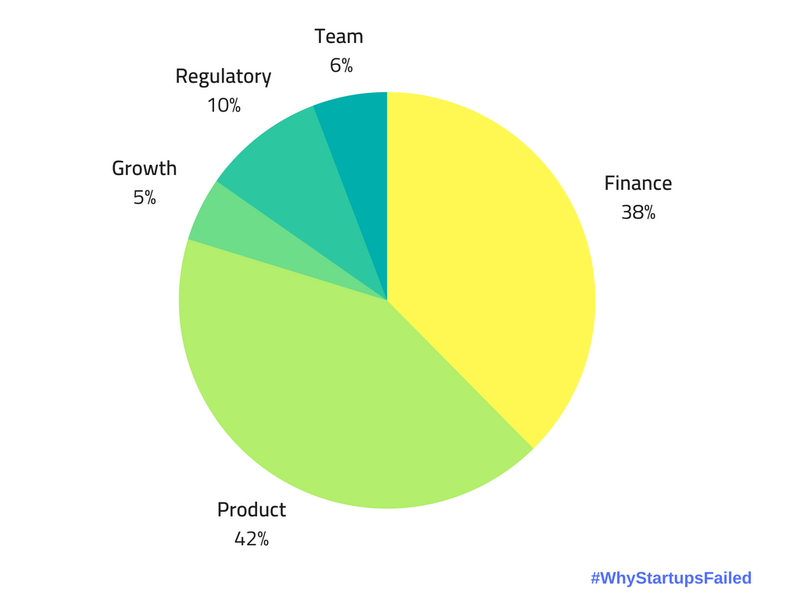 Hackernoon have also been exploring why startups have been failing, publishing a chart which shows that when startups fail, the following reasons are the most common. The 10% of startups that do succeed, seem to have a lot in common, even if they don’t share the same industry. Firstly, they’ve managed to create a product or service that perfectly fits in with the objective of solving a major problem for their chosen market. Secondly, their team will have the adaptability and the presence of mind to change things in the event of a crisis, to prevent their startup from failing, in the business world, stagnation ultimately leads to failure. Finally, members of their team will all work together and there will not be a strict protocol on sticking to your roles, everybody will chime in with their own take on an idea to achieve group consensus, two heads are better than one after all. When it comes to product, which from looking at the figures is the big reason why most startups fail, the actual reason for the failure is because the product itself did not actually provide an effective solution to a large requirement within their chosen market. With this in mind, we are going to be going over a few things that you can do, to help maximize the chances of your startup succeeding, so you can avoid some of the pitfalls that most entrepreneurs walk straight into. Generally, startups market themselves by saying that they have found the perfect solution to some kind of problem. They then go on to talk about how their services will help to revolutionize their chosen market and will eliminate the problem altogether. This is all well and good, but, when planning for your startup, you need to make sure that there is actually demand for a solution to the problem you are wanting to tackle. If there are only a few people who experience the problem that you will be fixing, then barely anyone will use your services, it’s that simple. You will want to avoid what a lot of startup founders are doing, which is creating a demand for a solution to a small problem. What you should, in fact, be doing, is as previously mentioned, finding a solution to a problem with a large amount of preexisting demand. Unless you’re already a massive company, your chances of creating demand yourself are very slim and even if you have a lot of money at your disposal, you’ll be wasting it by pushing something that nobody really wants and your startup will die. An example of where a startup failed to have enough demand for their solution can be found in the now defunct company Raptr. They were a PC gaming startup that allowed their customers to optimize their system’s performance without impacting quality and the efficiency of their systems. However, very soon after their launch, they eventually failed in 2017. The reason for this was released in a statement by Raptr. The statement reads “The world is different today than when we first launched Raptr. Many companies offer game optimization tools. Having an independent platform to do this is no longer necessary”. This is an example of where a startup has not focused their business model around a problem with sufficient demand for a solution, rather, the problem was incredibly niche and eventually, other PC gaming companies were able to offer similar and better services, without the need for an outside source. Raptr’s USPs and the way it worked was no longer convenient for its customers, nor were they even the best option. One of the most important components to the success of your startup is marketing, there are no two ways about it. You can have the best product in the world that actually will revolutionize your industry, but, if your marketing efforts extend to a few Facebook posts here and there, you’re going to fail. To effectively market your startup and your services, you need to appear everywhere, so that you can engage with as many potential users as possible. Thankfully, we now live in the social media world, where a mass of people can be found at the click of a button. You can either do your own marketing by posting videos and various posts on sites like LinkedIn, Medium, Quora etc, making use of SEO and placing paid adverts on various search engines. Furthermore, if you don’t feel you have the ability to do so, you can consult an external marketing agency to handle all of this for you. Sometimes, this is actually the best option as they will be able to get your great exposure for the money that you pay, leading to a lot of potential customers and buzz surrounding your startup. founder, John O’Nolan released a statement explaining why this happened. The company sought to bring new media and modern technological approaches to their industry by covering travel news and startups in that space. The problem with travelllll.com was that they worked through a system where they needed to effectively market themselves to continue growing. However, they weren’t able to effectively market their services, only having a few thousand consistent users and it led to the demise of their company. One of the things that quite a few startup founders seem to forget about, is the importance of their own team. The people that you hire may have been with you from the start and may have greatly contributed to the success of your startup, however, like any employee, they will begin to search for another job if they do not feel satisfied in their current role. Having high staff turnover can be extremely damaging to a startup, as you may begin to lose consistency in the areas where you are experiencing turnover, which can lead to your business performing less effectively. To ensure that your staff want to stay, treat them like human beings! Your team will all have their own particular things that they want from you as their boss. You should explore various ways of maximizing employee engagement, this could be by investing in well-being programmes in the workplace, work socials and even by offering longer-term employees a slice of the equity in your company. If an employee feels like they have a vested interest in their work, be that friends, shares etc, they will be less likely to leave. The last thing you want is them going to one of your competitors, or worse, run loose and drive your company into the ground. Unfortunately, examples of ineffective teams ruining a company can be found in abundance. One such example can be found in the Russia-based, e-commerce platform Wikimart. The company was a massive success domestically and was being labelled as the eBay of Russia since they were founded in 2008. Despite this, turmoil at the boardroom level led to a string of poor decisions and the company was subject to numerous bankruptcy orders in 2017. The lesson to be learnt from Wikimart in this respect is to ensure that you have a team around you which you can trust. To inspire loyalty in your team, you will need to make sure they stay happy. Some of the ways in which you can do this have been covered above. One of the most important things for you as a startup founder is to have a product which you can be proud of. If you were to have a product that was mediocre or even poor, you probably wouldn’t think too highly of it, well, your customers will also be thinking the same thing. Having a better product will naturally increase the growth potential of your business as more people are likely to be drawn in by the higher quality product. This will also be crucial when you are looking to secure outside funding from an investor. A great way to test whether you have a product that you can be proud of is to note whether your own team are openly advocating your product without your involvement. If they are, you’re on to a winner and you most likely do have a brilliant product. If however, they are reluctant to do so, you may figure out why this may be, and you may want to have a rethink about certain elements of the product. There are numerous examples of companies that have had to shut down because their product was not well received by customers. They did not take into consideration whether the product would create a good user-experience and definitely did not take the time to analyse the product to make sure it was something that they could be proud of. One such example can be seen when looking at political, social media startup VoterTide. VoterTide provided analytics and monitoring on social media for political campaigns, news companies and other organizations. It’s clear that VoterTide went wrong by instantly assuming that their product was one that they could be proud of, however, when it came to the actual customer response to that product, it was clear that they didn’t effectively cater to the needs of their customers. This is what caused their eventual collapse. Originally published at startupstash.com on February 27, 2019. This story is published in The Startup, Medium’s largest entrepreneurship publication followed by +429,678 people.